The season is well under way and is looking to shape out to be a thriller. Old folks Cornered Tigers won the toss against Big Bite Chesham and elected to bowl first with a spearhead swing bowling line up they have. 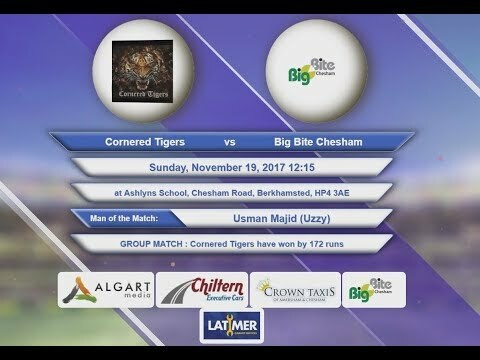 Big Bite Chesham openers started off very slowly due to the sheer swing the Cornered Tigers were bowling with. Big Bite posted 22 runs after the first partnerships only to go even lower by the end of the second partnership to 16 after the pair put on -6. The following partnerships still could not cause immense still struggling to find the timing and power to score efficiently. The final partnerships could only manage to put on 65 runs between them and not troubling the Cornered Tigers bowlers. Khalid Bashir top scored with 15 for Big Bite and Khalil was the pick of the bowlers with 3 for -4. Cornered Tigers started off strongly as always scoring at a calm and collective rate knowing the task ahead was easy and should not trouble them at all. The first two partnerships had posted 76 runs falling just 5 short of the target. Here on everything was going to be a bonus and just help their run rate. The following two partnerships manage to put on 138 runs and take them well beyond their target to 214. The final pair put on 39 runs taking the score to 253. Nughman Latif top scored with 30 runs off 11 runs and Intikhab Mazeez was pick of the bowlers with 4 for 4 runs. Man of the Match was Usman Majid for scoring 29 runs off 9 balls and bowling figures of 2 for -1 runs.